Ok ladies…this one may be tough for some of you! In full disclosure, I have never really been a shoe person. I know, I am the odd one! My mother would be embarrassed to see my admit this, lol. But I just appreciate comfort over style- and I have small, wide feet which makes shoe shopping awkward. Anyway, simply because of my family’s size, we have a lot of shoes. Shoes are everywhere…and yet…we are always missing shoes. The kids can find one shoe and not the match…all the time. It’s a constant battle and I know many moms can relate. We are focused on completing one small task each day this month, not turning the whole house upside down. So, I am going to focus on the shoes that are actually IN the house, in use…not the shoes that are stored away for another season. If you would like to organize those seasonal shoes, just use the same methods listed here for those. Take ALL the shoes that are in your house and put them in one central spot so you can easily go through them. Throw away any shoes that truly doesn’t have a match. Throw away shoes that are worn out or broken. Decide if the shoes left actually fit a family member right now or if they need to be stored for a younger child. Consider the space you have in your home for shoes…how many pairs should each family member have out at one time? Put all shoes that don’t fit anyone, but are still in good shape, in the donate box that you should have at your door. Be sure to drop them off the next time you are out. 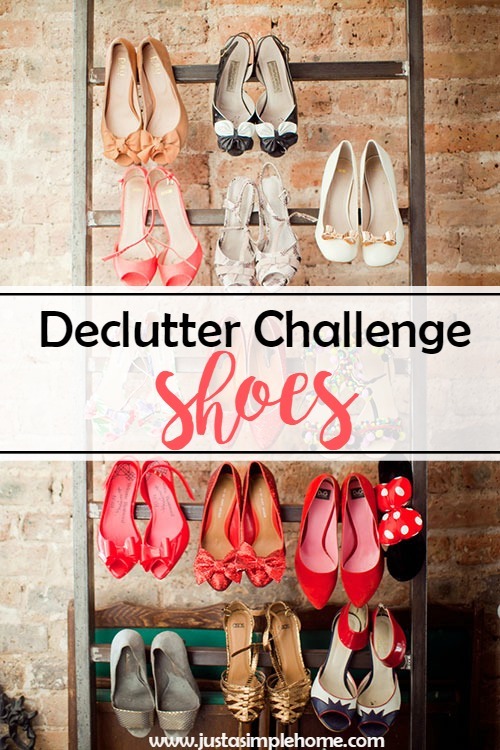 Now that you have purged and decluttered your shoe pile, you need to find a proper way to keep them organized. Do you have a bench in your entryway or a rack over a door? Do you need to go purchase something that will make keeping shoes in one spot easier? If you use these steps, you should be able to keep your shoe collection organized. Tell us, how many pairs of shoes did you throw away or donate? How do you feel? I’ve been decluttering my house and it feels great! There are still a lot of things I need to do though! I’m not much of a shoe person either, but I’m sure I have some that need to move on. My youngest son just outgrew a pair of shoes, so it is time to get rid of them too. I am going to need to read your other declutter challenges. Thanks Beth, I hope you find it useful! We are doing a little bit all month long. I have such a hard time throwing shoes out if I don’t have a replacement for them! I am a shoe person and I have so many pairs of shoes, but I can’t seem to part with them! I need to go through my shoes and throw out the ones that are just worn out..and then go and find good replacements 😉 I can’t help myself! I have GOT to do this immediately. We have so many shoes scattered all over our house right now. I love that first picture with them all in the boxes, but that realistically won’t happen. We do have storage for them in the front hall, so if I de-clutter they might all fit! Thanks for the suggestions! What a great idea to focus on one task a day. I did this earlier in the year and felt so accomplished after finishing. Hope the process is going great for you! Thanks Cara! It is going well and my husband is happy because of it, lol. January seems to be the typical time to organize, but for some reason I feel the same way in the summer. Maybe all the fresh air!